Several message boards appear throughout the administrator and member programs. First, the GolfLeague staff posts messages from time to time to the admin welcome page updating administrators with new information and tips for making the most of the program. Golf league help and tip files also use this message board. Administrators can also post messages on the member message boards. You will be able to post and/or email the message to your members. This is a great communication tool for up-dating members on weather conditions, league results, etc. The first thing your members will see when logging in is messages from you. Members will get used to this feature and immediately check the message boards upon logging in. This is an easy check for the member as the message board will be on the first page that the golf league member will see. 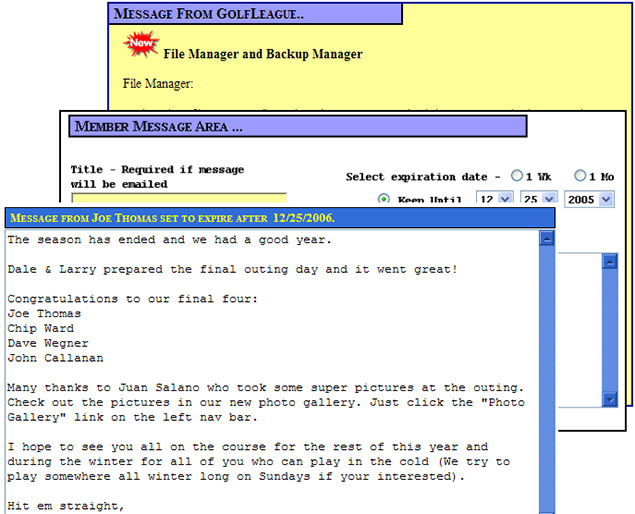 Excellent communications is a major part of the GolfLeague Software. You will see throughout the golf league software many communication features. Even with all the communication features available in the golf league software, communicating with members is still the toughest part of an administrator's job.
. Message boards are only part of the GolfLeague.us initiative to make it as easy as possible for an administrator to effectively communicate with his or her league members.